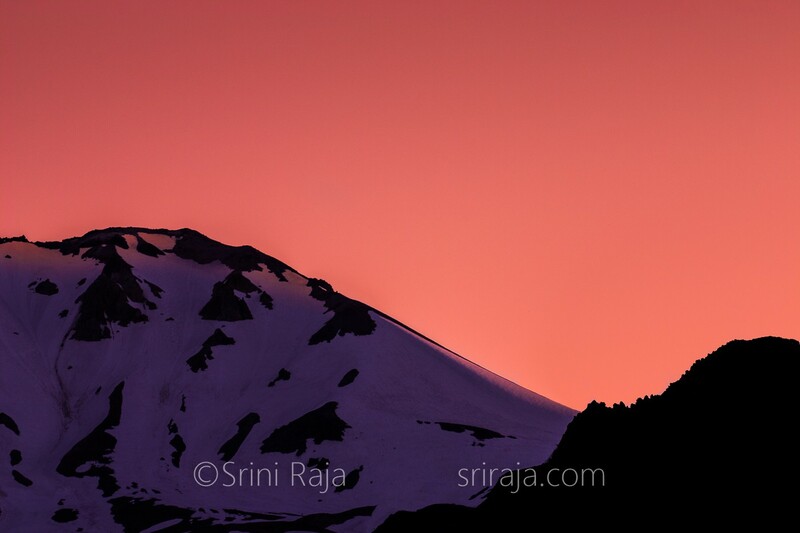 I visited Mount Lassen during 2006, and took this photograph during the wonderful sunset there. Lassen is not that often visited compared to Mount Shasta. Lassen erupted in 1915 and photographs by B.F Loomis made this into a National Park. This photograph was taken from the devastated area of the Lassen Volcanic National Park. During the 1915 eruption, rocks and lava was spewn across and this section of the park bore the front. Hence called Devastated Area. Although I went in early July, the mountains had enough snow and many roads were closed. Mount Lassen is a park many miss because of famous parks near by but I highly recommend it. On the photograph itself, I was actually on the east side of the park and realized I was in a bad position for a photograph but as I saw the sun going down, the last few rays touched the right side of the mountain and I was able to capture this photograph.